Wanna get away from it all without succumbing to the slogan of a certain airline? Lifetime’s re-do of Beaches (Saturday, Jan. 21st at 7 p.m. central) provides a suitably weepy, sometimes sappy, overall entertaining escape. It’s also color-blind, with the rocky road relationship of CC Bloom and Hillary Whitney going seamlessly interracial. 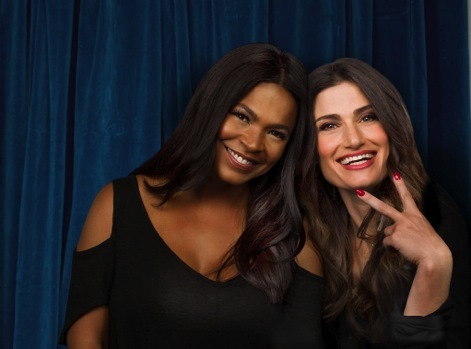 The principals are played by Idina Menzel (as CC) and Nia Long (Whitney) a generation after Bette Midler and Barbara Hershey teamed in the 1988 feature film directed by the recently deceased Garry Marshall. The basic storyline remains intact if notably contracted. The original ran for a bit over two hours while Lifetime’s version clocks in at a little under 90 minutes after the commercials are subtracted. So yeah, the pace is a little rushed. The scene-setting opening beach also has changed, from the Atlantic City boardwalk to Southern California’s Venice. That’s where CC and Whitney first meet as pre-teens. Their friendship is instant and then long distance into their early adulthoods. After graduating from Harvard, Whitney festers unhappily in her father’s law firm while CC struggles to make it big as a singer-actress. They finally reunite in a hotel lounge, where CC is performing and her surprise visitor has just impulsively quit the firm. Initially they’re never happier than when living in CC’s very cramped L.A. apartment. The entrance of dashing director John Pierce (Antonio Cupo and John Heard in the feature film) signals the start of a love triangle. He grooms a smitten CC to be a star and likes her well enough otherwise. But Pierce has bigger eyes for Whitney while also coming off as an amazingly benevolent and kind musical director. Ray Fosse he’s not. As in the movie, CC and Whitney go their separate ways after the latter’s father dies and she’s roped back into the law firm. CC in turn becomes both a hit recording artist and the star of a cheesy TV series called Pretty Sinners, where she plays a nun. OK, that’s enough exposition, other than to note that of course CC and Whitney get back together after first yelling at one another. Then come the weepy parts. Long, best known for 2013’s The Best Man Holiday, gets to emote more down the stretch, doing so capably as Beaches ladles on the heartbreak. The remake of course includes “Wind Beneath My Wings” (which should have been the closer this time) and “The Glory of Love,” which first became a hit in 1936 and ends both versions. Beaches remains one of the quintessential “chick flicks,” but also hits some bulls eyes as a “date movie.” The Lifetime makeover also airs in starkly changing times for all concerned. It may not measure up to the original, but scores points with a friendship in which race is entirely beside the point -- as it should be. And the torch songs retain their snap with Menzel at the mike and Allison Anders directing. It’s all part of Lifetime’s “Girls Night In” come-on, with next Saturday bringing “Love By the 10th Date.” That’s gonna be way too much to take for your friendly content provider. But Beaches hits some sweet spots without being overly taxing on the male gene.